Topics: Saudi Arabia’s war in Yemen, Nigeria’s election outcome. People: Bill, Nate, Sasha. Produced: April 6th, 2015. – Why is Saudi Arabia leading a massive military intervention in Yemen? – What is the significance of Nigeria’s peaceful democratic transfer of power between parties? Topics: Big Ideas for Reforming American Governance: Does the US have too many elected offices? Should legislators be trustees for or delegates from their voters? People: Bill, Nate, Sasha. Produced: March 30th, 2015. – Do we have too many elected offices in the United States? Should most elections occur at the same time (e.g. on the presidential ballot) or be spread out? – Which offices should be elected and which appointed? When should policies be created by elected officials versus subject experts? – Are elections too complicated to produce clear mandates for various offices and identify the will of the people on specific issues? – Is the role of an elected official to be a trustee acting independently in the best interest of the people regardless of their views, or is it to be a delegate with a mandate to fulfill the people’s wishes? Topics: Who will shape the 2016 presidential election issues most? What are the consequences of the 2015 Israeli elections? People: Bill, Nate, Sasha. Produced: March 23rd, 2015. As kids, we’re told money can’t buy happiness — but our parents never said anything about presidential elections. The Koch brothers announced last month their intentions to spend $889 million on the 2016 presidential election. All joking aside, the Koch brothers are a simple reminder of the dangers of money in politics. Their network is made up of a plethora of advocacy groups and nonprofits; a system that allows their donors to stay mostly anonymous. Which means we don’t know where the money is coming from (although a safe bet is that it’s the 1%). The announcement was made at a donor meeting for Freedom Partners, a business lobby that serves as the head of the snake. Keep in mind that Wisconsin Gov. Scott Walker, Sen. Marco Rubio (R-FL), Rand Paul (R-KY) and Ted Cruz (R-TX) — all likely candidates for the Republican nomination in 2016 — were all in attendance and available for mingling with the wealthy Americans pulling the strings of politics. The conservative donors also stuck around for strategy sessions and issue seminars, according to The New York Times. The strategy sessions must be paying off though, as the Koch brothers have been using their wealth to influence more than just national elections. They have played a role in state elections as well. The American Legislative Exchange Council is a conservative advocacy group, and a part of the Koch network, that has more than 2,000 state legislators as members. ALEC has been most useful in their fight against the Obama administration’s energy and environmental regulations. Does this sound familiar? In December I wrote about Republicans not only taking over the Senate, but also dominating state legislatures across the country, as well as about the combined efforts of Republican State Attorneys General to overturn environmental regulations. The Koch brothers, and their money, have seeped into every crevice of American policy and politics. When it comes to state campaign finance, it’s mostly uncharted waters. The rules vary a lot more already. But on the national stage there has been a lot more influence from a select few in recent years, mostly due to the significant new changes in campaign finance law. Without delving too deeply into the Citizens United v. FEC, the court majority’s main argument was restricting political spending was restricting free speech, even of associations of individuals (i.e. corporations). The court went even further in 2014 with the ruling of McCutcheon v. FEC, which places no cumulative limit on individual contributions to candidates. 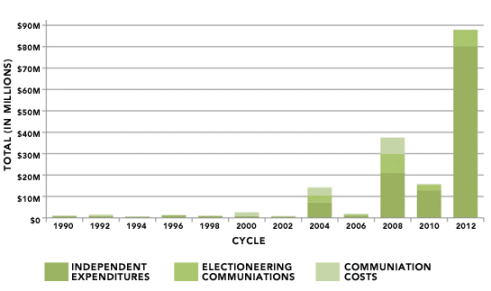 The trend continued in Congress, when in December 2014 they passed the “CRomnibus” (continuing resolution omnibus spending bill), which rolled back more campaign finance rules, significantly lifting the caps on donations to campaign committees. These decisions and new laws have had many different impacts, but the one to focus on here is that the billionaire Koch brothers get a louder and more influential voice in politics because their pockets are deeper than most Americans. I say most Americans, because there are other wealthy people (besides the Koch brothers) who have increased their donations to political campaigns since the Citizens United decision. As the chart below illustrates, spending that once hovered under $10 million has skyrocketed in the past 7 years. Still, conservative donors are, by volume of donations, effectively the only ones throwing money at candidates. True, names like Michael Bloomberg and George Soros show up on the invite list to big Democratic donor events, but even their combined contributions for 2014 were less than $30 million. That’s equal to 3% of my new favorite number: $889 million. And the rest of Americans are barely noticeable. The pressure is on for Democrats and anticipated frontrunner candidate Hillary Clinton. While Barack Obama spent just under $800 million in the 2012 election, he managed to raise more than any other presidential candidate in history. So despite claims that liberals run most of Hollywood and the news media, it’s clear that they don’t come anywhere close to scrambling up nearly a billion dollars to elect a president. The Koch brothers are essentially doubling the Republican war chest with the extra $889 million, while the Democrats will be lucky to raise half of that combined total. Even so, the reason $889 million is so outrageous is not because there is no way Democrats can compete. It’s because, for working and voting Americans, I think it highlights the question: Who is really electing our President? Correction: An earlier version of this article included a numerical error in contributions to Democratic candidates due to an editing mistake. Tom Steyer donated $74 million to Democratic candidates in the 2014 cycle. He should not have been included in the $30 million / 3% figure in the original version. Steyer’s 2014 contributions amount to about 8% of $889 million.